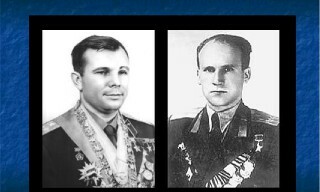 Every year, on March 27, the Gagarin Cosmonaut Training Center and Star City pay tribute to the Heroes of the Soviet Union, pilot-cosmonauts, Colonel Yuri Gagarin and military pilot, 1st class test pilot, Colonel Vladimir Seregin. 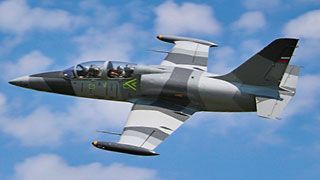 On this day in 1968, a MiG-15 UTI fighter crashed near the village of Novoselovo, Vladimir region, Russia, killing Yuri Gagarin and Vladimir Seregin. Traditionally, on the Day of Memory of Gagarin and Seregin, on March 27, family members, cosmonauts, veterans and Center staff take part in a number of events. 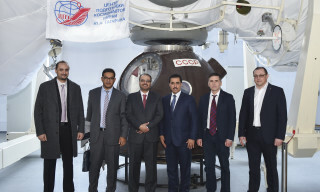 Less than a month is left before the launch of the "Soyuz MS-12" spacecraft. Yesterday at the GCTC was the second day of complex examination exercises, based on which will be decided to continue preflight crew training at the Baikonur cosmodrome. Encouraged by the “excellent” grade for the first examination training on the ISS, the main crew of the ISS-59/60 began today the final day of testing on the "Soyuz" spacecraft simulator. At the end of exams of the main crew of the ISS-59/60 the commission summarized the results of the second exam day. 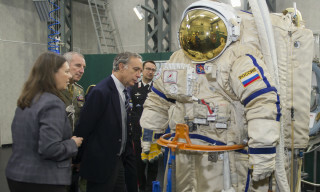 The main crew of the ISS approached the most important stage of preparation at the GCTC - the complex exam training. During the examination session, the commission assesses the actions of the crew in the work with the equipment and life support systems at the station. The exam result also determines the reaction of future participants of a long expedition to emergency situations. 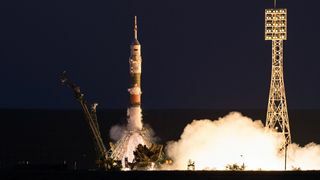 The crew must timely detect the failure or mismatch of the ISS systems, determine the nature of the incident and promptly make a decision to get out of this situation. From the quality of their actions depends the score for the exam day. 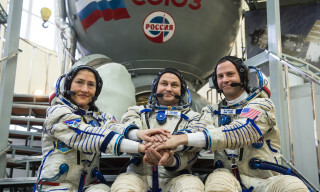 Having successfully passed the exams on manual control of transport manned and cargo spaceships, the main crew of the ISS this Monday continued to pass the "space" exams. The working week of "Soyuz MS-12" commander Alexey Ovchinin and flight engineer Nick Hague began with the manual-controlled descent exam on the TC-7 simulator, based on the CF-7 centrifuge base. 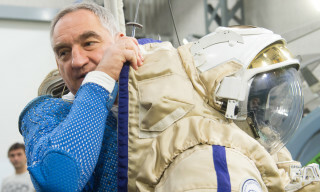 Taking into account that Alexey and Nick passed such exam on the Soyuz spacecraft several months ago as part of "Soyuz MS-10" crew training, the high level of their knowledge and skills during the training was rated by the commission as “excellent”. The examination week of the main crew of the ISS continued with a test of knowledge of the Russian segment of the International Space Station. 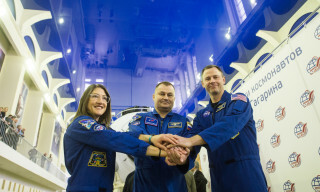 The two-week training sessions for the main crew of the ISS were the final training for the complex exams, which are to be held by Alexey Ovchinin, Nick Hague and Christina Koch after one week. 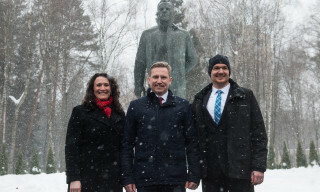 Despite the strong wind and snow, not only the Star City residents and the staff of the GCTC came to greet the crew of the 56/57 expedition to the ISS, but also the leaders of the rocket and space industry enterprises, as well as the ambassadors of the United States and Germany in Russia John Huntsman and Rüdiger von Fritsch. 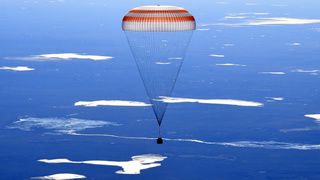 The crew members of the "Soyuz MS-09" (call name "Altai") Roscosmos cosmonaut Sergey Prokopiev, ESA astronaut Alexander Gerst and NASA astronaut Serena Aunon-Chancellor returned to Earth safely on December 20, 2018 after performing a 196-day flight. 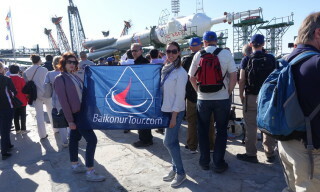 Ambassadors of the United States and Germany, representatives of related organizations of the rocket and space industry, foreign space agencies, municipalities and other associations, cosmonauts colleagues warmly welcomed the crew, handing memorable addresses and gifts. At the end of the meeting, the crew of the ISS-56/57 thanks all those, who were involved in their flight.